The Economic and Financial Crimes Commission on Friday denied raiding the head office of Standard Chartered Bank in Lagos. “There was no raid on the bank by its (EFCC) officers,” EFCC’s Head of Media and Publicity, Mr Wilson Uwujaren, said in a statement after media enquiries. The enquiries followed reports that about 20 operatives of the anti-graft agency raided the headquarters of the bank, which was one of the four banks that were fined by the Central Bank of Nigeria for allegedly aiding the illegal repatriation of funds from Nigeria by MTN. Such a move contradicts the operational procedures of the bank, according to the statement. 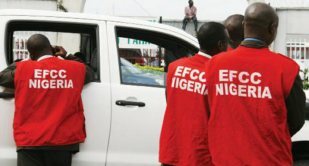 Although the EFCC denied ordering a raid on the bank, it did not rule out the possibility that its “errant officers” might have carried it out. As a result, it plans to investigate the reported raid. “The Commission will investigate the circumstances leading to this illegal raid by errant officers and those found culpable would be subjected to the internal disciplinary mechanism of the Commission,” it said.